D-Mulsion 1000 from Genestra uses only the most pure and natural ingredients to bring you the highest quality liquid D3 supplement available. 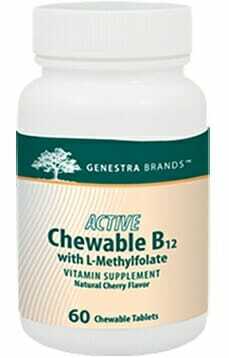 Provides support for bones, joints, and numerous other parts of the body. Also aids in the absorption of calcium. Purchasing this product today earns you 21 DR Reward Points! Vitamin D is a vitally important nutrient, not only for maintaining strong bones and joints, but also for supporting numerous other bodily systems and functions. As such, the market is flooded with supplements which are designed to keep the body supplied on this vital nutrient. 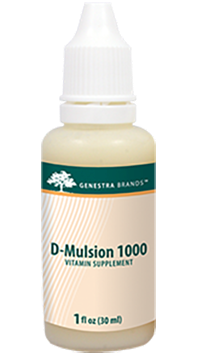 For those who are looking for a Vitamin D supplement which is a cut above the rest, look no further than D-Mulsion 1000 from Genestra! Contains a powerful and balanced 1000 IU dose of Vitamin D3 per serving. A perfect Vitamin D supplement for vegans and vegetarians, as well as those who are sugar-free and gluten-free. Provides nutritional support for healthy bones and joints, as well as numerous other bodily systems and functions. 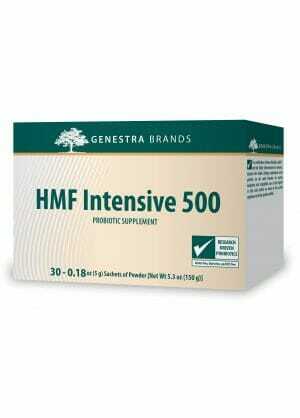 Aids in the proper absorption of calcium and other important dietary minerals. Stevia and WisdOM-3• proprietary emulsification process greatly improves the overall taste of this natural liquid vitamin formulation. At $20.80 for 1200 serving, this is one of the greatest values on the market! It is impossible to overstate the value of Vitamin D in keeping the body strong and healthy. It plays a role in so many bodily systems and functions, that a complete deficiency would leave the body in critical health condition. Thankfully, Vitamin D can be found in a wide variety of common food sources. What’s more, it can even be produced organically in the body as a result of sunlight exposure. For this reason, most people do not experience Vitamin D deficiency until they reach more advanced ages when the body’s ability to produce this vital nutrient tends to diminish. However, it is also fairly common for people to experience difficulties processing Vitamin D from dietary intake due to complications in the digestive system, or any number of other complications which may put the body behind on its Vitamin D supply. In these cases, Vitamin D supplementation represents a safe, convenient, and affordable way to keep the body in balance. There are also a wide variety of Vitamin D supplements which offer customizable solutions depending upon one’s particular cause of deficiency. What Makes this Vitamin D Supplement a Cut Above the Rest? 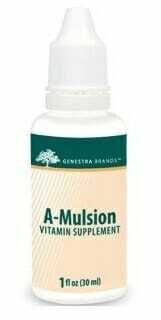 D-Mulsion 1000 from Genestra is an all-natural liquid Vitamin D3 supplement which is an ideal choice for those who have received poor results from capsules or tablets, possibly due to digestive complications, or even difficulties with swallowing. It is also the Vitamin D supplement of choice for those who are vegan, vegetarian, gluten-free, sugar-free, or are otherwise concerned with what they put in their body. That’s why D-Mulsion is free from any artificial sweeteners, colors, or flavors. What puts the ‘3’ in Vitamin D3? It’s a simple question, but the answer is quite complex. D3 is an abbreviated name for cholecalciferol which is what’s produced in the skin upon exposure to sunlight. There is only one other form of Vitamin D which is known as ergocalciferol, or D2, which is obtained from food sources. There is little debate about which of these forms is superior for supplementation. Experts almost unanimously agree that Vitamin D3 is not only more easily absorbed within the body, but also more safe for consumption in large doses.1 As such, Genestra only uses the highest quality of D3 available to ensure that D-Mulsion 1000 is the most safe, effective, and scientifically-approved Vitamin D supplement on the market! Can be dropped directly in the mouth or mixed into drinks. Dosage can be adjusted by the drop. Note: Vegetarian, vegan, gluten-free, sugar-free, no artificial colors, sweetener, or flavors.